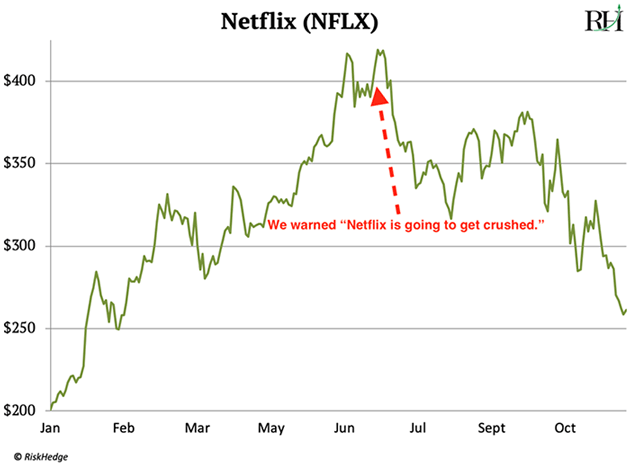 If you’ve been reading RiskHedge, you know I’ve been warning you to keep your money out of stock market darling Netflix (NFLX). Back then Netflix was the hottest stock on Wall Street, had surged 107% in six months, and was hitting record highs. But it turns out that July was the right time to bail out of Netflix. You can review my reasoning for why Netflix is set to disappoint here and here. For years it was the only streaming game in town. Early investors rode this first-mover advantage to 10,000% gains from 2008 to July of this year. But the door is slamming shut on Netflix’s Goldilocks era where it enjoyed almost zero competition. Meanwhile Netflix will lose a lot of its best content… and potentially millions of subscribers who switch to Disney+. If that’s not bad enough, Amazon (AMZN) is carving out a foothold in streaming, too. In February, Amazon announced it would spend $5 billion developing original shows and movies this year. In response, Netflix upped its spending by 50%. Problem is, it can’t. Netflix makes only a small profit, so it’s had to borrow gobs of money to fund its show creation. Its debt has exploded 71% in the past year to $8.3 billion. That’s not sustainable. Netflix has three bad choices: continue borrowing billions and bury itself deeper in debt… dramatically raise its subscription prices… or cut back on making new content. It has dropped to around $275 today. And as I mentioned last time, my research shows its worth $190–$200 a share, max. Disney, on the other hand has gained 11.5% since July and hit multi-year highs earlier in November. That’s doubly impressive when you consider most stocks have struggled in the last few months. Disney is still a great buy at today’s price of $116. It’s heading for $170—roughly 45% higher than today. On a separate note, have you been following uranium prices? 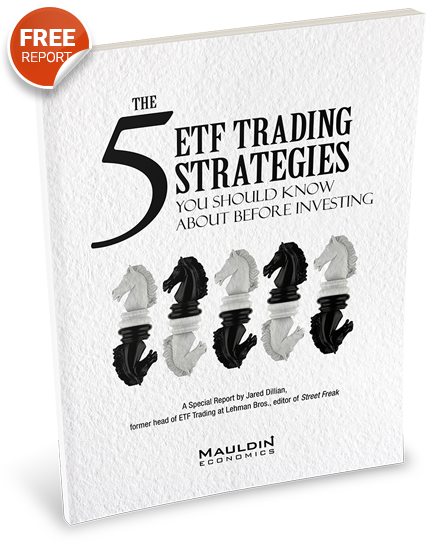 We last discussed uranium in August when I wrote it was one of the best moneymaking opportunities I’d seen in years. In the last few weeks, uranium has hit its highest price since early 2016. This time last year, the uranium price was sitting at $18 per/lb. It has shot up 55% to $28 per/lb since then. And my research shows it’s headed A LOT higher. As you likely know, uranium is used by nuclear power plants to produce electricity. Some readers have written in to express their unhappiness that I’m investing in “dangerous” nuclear power. But despite its reputation, the fact is nuclear energy is quite safe. And it powers one in every five American homes. But thanks to a supply-demand imbalance, the uranium price had cratered 85% from 2007–2017. Almost no company on earth can turn a profit selling it at today’s prices. But the catalyst for a BIG surge in uranium prices is fast approaching. Nuclear power plants are the largest buyers of uranium. Between 2005–2012 they signed contracts for roughly 1.55 billion lbs, giving them enough supply to last years. But supply is finally running out. On average, nuclear plants have about two-and-a-half years of supply left. They typically keep between 2-3 years in inventory. So, they’ll have to buy more uranium soon. But it’s not that easy. Producers have said they won’t sign new contracts until the uranium price rises much higher than where it is today. After all, why would they deplete their assets for a loss? From talking with industry insiders, many producers will hold out for about $70/lb uranium. Or 140% higher than today’s price. Many folks are surprised to learn that uranium only accounts for about 3% of the cost of operating a nuclear plant. So, it doesn’t matter much to their bottom-line profits if they pay $30/lb or $70/lb. In August I recommended you buy the world’s largest public uranium company, Cameco (CCJ). We’re doing well on this trade, having gained around 11% so far. But as the price of uranium surges, Cameco will head much higher. Now is an excellent time to buy. As I’ve explained in the past, uranium stocks are extremely cyclical. Once they enter a bull market, they can rocket higher at warp speed. Keep in mind, Cameco shot up 2,000% in the last uranium bull market. That’s it for today. As always, you can reach me at stephen@riskhedge.com.